I consulted several recipes on the internet for game terrine and although they had differences in content and method, they all followed a general pattern. Some chefs added sausage meat or force meat, others did not; some layered the force meat and the game in several layers and some just laid it at the bottom of the terrine (which becomes the top when served) and on top. Hugh Fearnley-Whittingstall lightly fries the strips of pieces of game before adding to the terrine; John Torode does not. John Torode adds white wine; Hugh Fearnley-Whittingstall and Woman's Weekly favour red. Chefs also disagreed in their choice of herbs - it's thyme for Hugh Fearnley-Whittingstall, Nigel Slater and Woman's Weekly (the latter adding rosemary as well); rosemary and tarragon for Gordon Ramsey; sage for the Hairy Bikers; and sage and tarragon for Jamie Oliver. Gordon Ramsey and James Martin also add cream. There seems to be a consensus that meat, garlic and brandy are the essential ingredients! For my traditional Christmas pork paté de campagne I usually use a spice mixture including coriander, nutmeg, cloves, ginger and cinnamon but I decided to keep it simpler for this game terrine. My advice would be to follow the basic pattern and method and use whatever ingredients you want or whatever is available. 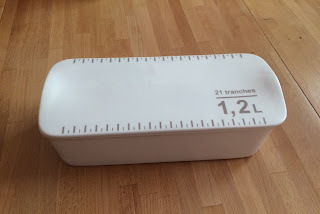 Basically for a 1.5 - 2 litre terrine or loaf tin you will need around 1 - 1.5kg meat plus 300-400g sausage meat and 300-400g chicken or game livers. I could not find any game birds locally so I used a mixture of chicken and duck with some venison. 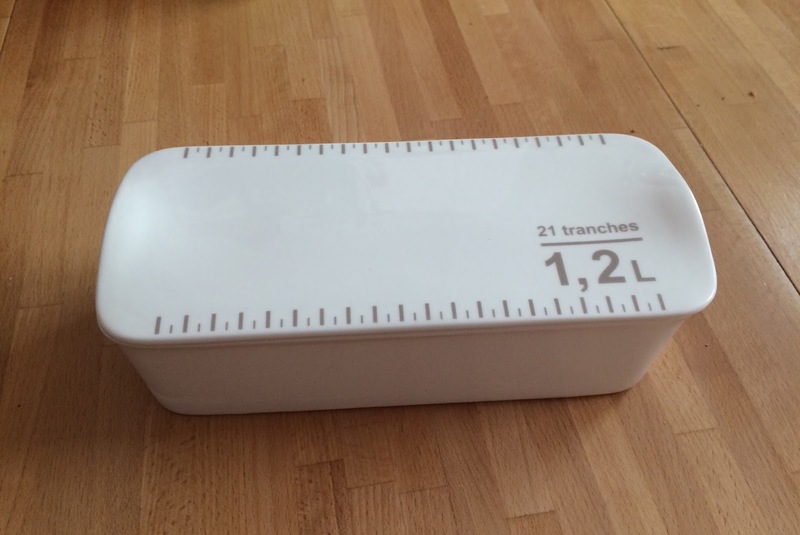 Using roughly the above quantities, I managed to fill two 1 litre containers - a loaf tin and a new porcelain terrine that I had received as a present. 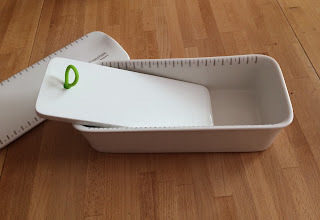 My porcelain terrine includes a weight for pressing down the meat when cooked. 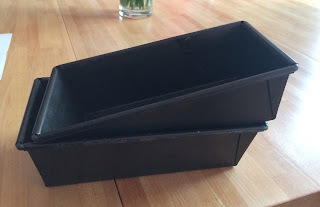 and a lid for storing the finished article. Start preparations two days before you want to eat the terrine. Remove the skin from the duck and reserve. Remove the skin from the pork belly and discard. Roughly chop the duck skins and add with the chicken livers and half of the sausage meat to a food processor and process until smooth. Grind the allspice berries and peppercorns, chop the tarragon and thyme, chop or mince the garlic and add to the processed chicken livers with half the pork belly, one of the skinned duck breasts, and a quarter of the chicken breasts and pulse chop till you have a lumpy mixture. Add one egg, lightly beaten, two tablespoons of brandy, 100mls dry vermouth (or white wine or dry sherry) and a handful of breadcrumbs and stir. If the mixture seems too wet and sloppy add some more breadcrumbs. This will be your forcemeat. Put in a bowl covered with cling film and leave for 2 - 3 hours or overnight in the refrigerator. After the forcemeat has marinated, take the venison steaks, chicken breasts, remaining duck breasts and pork belly and cut into long strips about 1 cm wide. Add a layer of force meat to the terrine and lay strips of the meat lengthwise. Add another layer of forcemeat and then a layer of meat. You can make as many or as few layers as you wish but always start and finish with forcemeat. Always push down as you add the forcemeat as you don't want to leave air pockets. When the terrine is full, fold over the bacon so the contents are fully covered. If there is a gap, lay more bacon to fill. Heat the oven to 160°C (150°C fan oven). The terrine needs to be cooked in a bain marie. 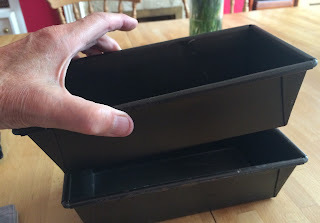 You will need one (or two) deep baking tins, large enough for the terrine to fit in comfortably. Cover the terrine with foil and place in the baking tin. Add boiling water to the baking tin to come halfway to two thirds up the terrine, and then place in the pre-heated oven for two hours. For best results you need to press the terrine as it cools. Remove the foil and press down with cardboard or plastic covered in foil or the weight (see above*). Pour off any excess fat. Leave the terrine to cool in the bain marie, then remove and keep weighted down in a cool place for several hours. When cool, remove the weights, slide a knife around the edge of the finished terrine, invert on a plate and lift the tin. If the finished terrine doesn't slip out easily, place the terrine dish in hot water for a few minutes and try again. It should slip out easily. Place the finished terrine in the fridge until needed but remove from the fridge one hour before you want to eat it. You should be able to slice it with a sharp knife. The terrine will keep for a week in the fridge. It can also be frozen and will keep, frozen for a couple of months. If it has been frozen, defrost overnight in the refrigerator and take out one hour before serving.